I have been so excited to share today's post with you! 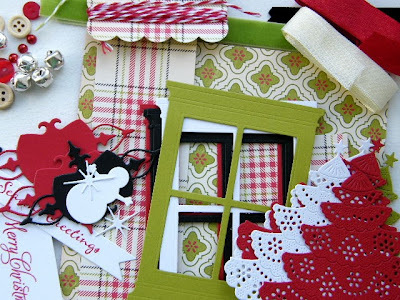 I am joining 11 other very talented ladies in a monthly Christmas card challenge called The 12 Kits of Christmas. I literally can not wait to see what everyone made with this kit! Each month the hostess sends out card kits to the other 11 members. Renee started us off with a kit that just literally blew me away when I opened it! There were so many goodies in there and probably enough to make 10 cards. Boy did she spoil us! She thought of everything! Card #1: Renee has been enabling lately and so I had an inkling she would be sending a certain 'window' die that she had scored. When it arrived, it was love at first sight I tell ya! Of course, it was the first thing I wanted to use. Everything you see on my card (except the Pure Poppy card base impressed with the Peace be Still Impression Plate) was included in my kit even down to the twine for the buttons! Now for that window........don't you just want to swoon? Look at all that detail! Sadly, I have not found my own die yet but am on an email list for one! 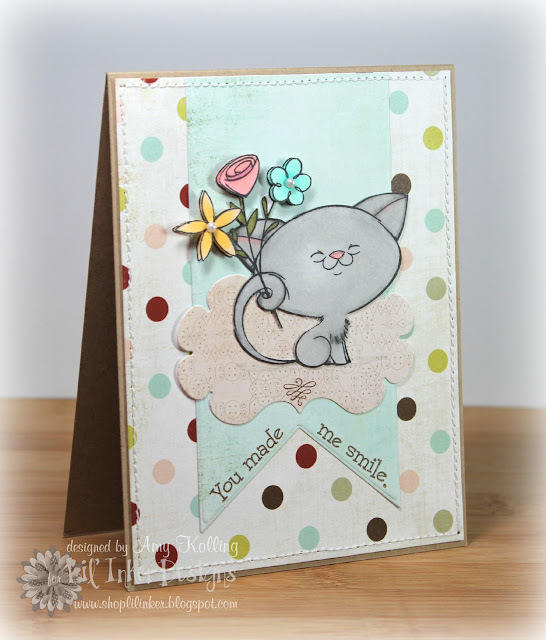 Card #2: My next card uses another fun die this time from Cheery Lynn Designs. The detail in this O Tannenbaum Christmas Tree is just amazing. I added in some red pearls (that were included in the kit) and some of my coveted silver ones to embellish the tree. I topped my tree with some Silver Stickles and layered my tree over some pattern paper from the kit. I then used the red seam binding to wrap and form a bow with a jingle bell accenting the center. Market Street Stamps Block Party Time! Now that you all are waiting on your NEW releases from Market Street Stamps to arrive in your mailbox, you have the opportunity to play along with us! What's up for grabs?? Well, lots of goodness including a GUEST DESIGNER spot!! Check out all the details on the MSS Blog HERE. I'm playing along using one of the newest sets (I love this one!) called Birds of a Feather. And for just a limited time, it's on SALE! Check out my design...........I haven't played along with the Girl Fridays in a while but when I saw this great CAS sketch, it was perfect for this cute little bird! 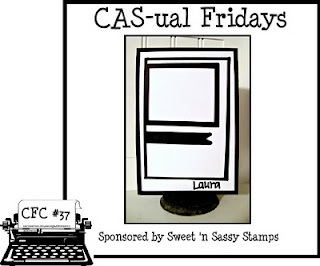 Here is the sketch from CAS-ual Fridays: CFC37! 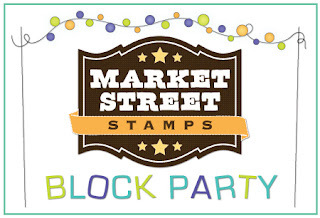 This is a great time for you to get those Market Street Stamps out and whip up a card for the Block Party. We'd LOVE to see what you create! Have a great weekend! Hi everyone! I'm here tonight with a sneak peek of 2 new sets (I've combined them here) for the new January release for Market Street Stamps! Two fabulous sets for that travel loving person. Here I've combined Travelscapes and Bon Voyage to create this fun vacation scene.......This is certainly a scene I would like to be indulging in right now! LOL I've stamped my waves from Travelscapes and layered them slightly and tucked in the cruise ship from Bon Voyage. When layering my waves, I pulled up the tips of the waves slightly with my fingernail......just a little more dimension! My "sky" background was stamped using the Grid Background stamp from MSS. I love that I can make my own grid paper! •The January release stamps will be "sneaked" on the MSS blog Monday-Wednesday at 7PM Central Time! •The full sets will be revealed on Thursday night! •Stamps will be available for sale following the reveal Thursday night! •The January release stamps will be 15% off in the store for an entire week following the release!! Want all of the sets? If you order the whole release they'll be 25% off for an entire week!! Can't beat that! Well I hope that you are enjoying all the new stamps from Market Street Stamps this week! Remember to join us for the Block Party that starts on Friday! Hi everyone! I have a sweet little Valentine to share with you today. It's no secret that I am in LOVE with Market Street Stamps background stamps, right? Well, here I've used the Hearts a Plenty background. I started with layering my strips of rainbow colored cardstock onto a white sheet of cardstock. I didn't worry if my strips "hung over". I then trimmed this whole panel down to size. Next, I broke out my Versamark ink and inked up my stamp......applying TO the stamp. I then took my rainbow panel and laid it over my stamp and rubbed firmly over the entire thing being careful not to move my paper. Removing my panel, I instantly have a gorgeous patterned background and the makings of a great CAS card. Adding in die cut letters to spell LOVE and a fun little arrow die cut rounded out my card. 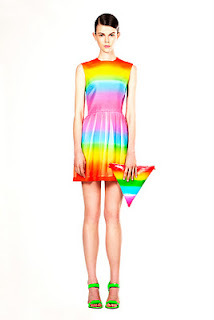 My card was inspired by the latest Runway Inspired Challenge: Christopher Kane Resort 2012. I've been eyeing these challenges and I decided that I just needed to give it a try! I was inspired of course by the rainbow colors but also I thought that my arrow shape and the hearts resembled the triangle the model is holding. ﻿Well I've had a few days of fun creating this week and now it's back to work for a few! Have a wonderful day and start to the weekend!!! It's supposed to be beautiful here in Kansas this weekend! 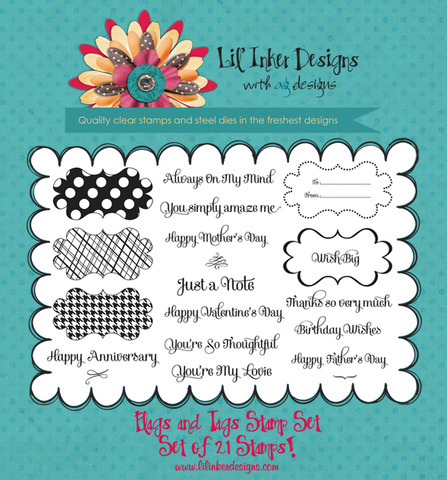 Lil' Inker Designs----Bonus Goodies Release! 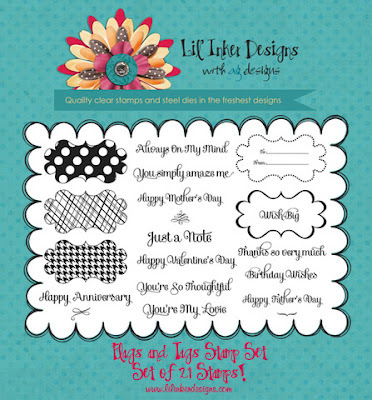 Welcome to the last day of the Lil' Inker Designs January New Release! Today we show you some bonus goodies with a Valentine theme! This is what you've been waiting for right? :) Following the blog hop, you should have arrived from my friend Jen Carter's blog. First, let's introduce: Hamster Cupid. Oh is his cute or what? 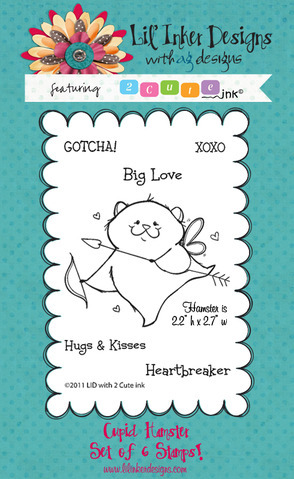 This is similar to our previous 2 Cute Ink sets but a smaller scale. I've paired Hamster Cupid up with some yummy papers from Echo Park called Be Mine. Oh all the patterns are just gorgeous! Now let's introduce: Of the Heart Stamps and Dies. I've used these new sets for a very CAS card to end this week's new release. I LOVE white on white cards so I thought this would be a great time to do one to highlight these new dies. 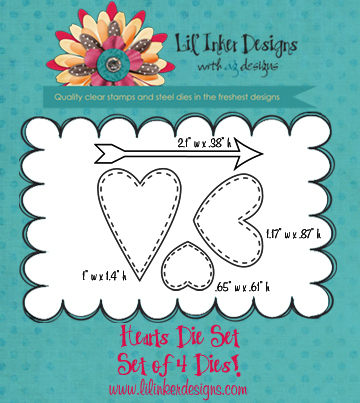 These heart dies have Laura's signature perforations and she even added a cute little arrow! I see myself using these ALL the time. You can never have too many heart dies right? Here I've used the smallest of the 3 heart dies. To add some interest, I've scored a frame around the popped up white panel. Well, that's the end of this FUN FUN release my friends!! 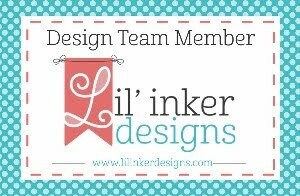 It's been so much fun this week sharing what's new from Lil' Inker Designs. Now it's your turn to go check out the new goodies and grab them for yourself!! You can find them over at the Lil' Inker Designs website HERE. I colored my Sweet Bee in with various Copic markers and then layered my image over yellow pattern paper from Echo Park. I decided that I enjoy picking parts of my image to pop up for a little dimension. Here I've done this with the bow and the heart. All my layers were machine stitched.....now I could have left it "alone" but it just screamed to have stitches! I'm lovin' my Janome Sew Mini....that's for sure! My sentiment is one that is included in this set and was heat embossed with white filigree embossing powder on the double ended banner die to give it a little extra pop! I've used the current CPS sketch (#251) for this except I changed up the half circles. Well friends, that's it for today but remember stay tuned for tomorrow's post for one more "cute" day! I can't wait to show you what the BONUS goodies are! 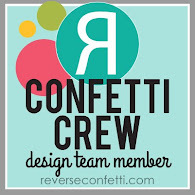 Your next stop is my good friend Jen Carter......she creates some of the most creative things! I think my favorite part of this new set are those adroable flowers. Particularly the center one! But I also can not resist that Cutie Cat face! Here I've chosen to color him in with various Copics and cut out the image. I layered the new BIG Flag die over some DP from FancyPantsDesigns that coordinates with my colored image. Call me crazy but for some dimension, I colored and cut out the flowers and popped them up! My Cutie Cat was layered over the tag die showcased in my post yesterday. I love how it looks like he's sitting on a little rug! hehe I've also stamped a tiny image included in the Flags and Tags stamp set onto the bottom of the tag for fun. "The oversized sentiment flag is a uniquely designed die. The die was designed much like a frame and then overlayed with a clear backer. It closely resembles a nesting die yet it has the addition of the clear backer which is really neat as it allows for perfect placement when cutting and it even embosses! Also, because the die was created with the clear backer it allowed us to keep manufacturing costs lower which means reduced costs for our customers. It's really a win win!" I want to extend a huge THANK YOU for everyone stopping by and leaving such sweet comments on my projects for Day 2. Remember that Laura is giving away 2 prizes if you continue on this hop and leave comments along the way each day! Your next stop is one of my good friends, Jen Carter, and I'm sure she is going to show something awesome like she always does! 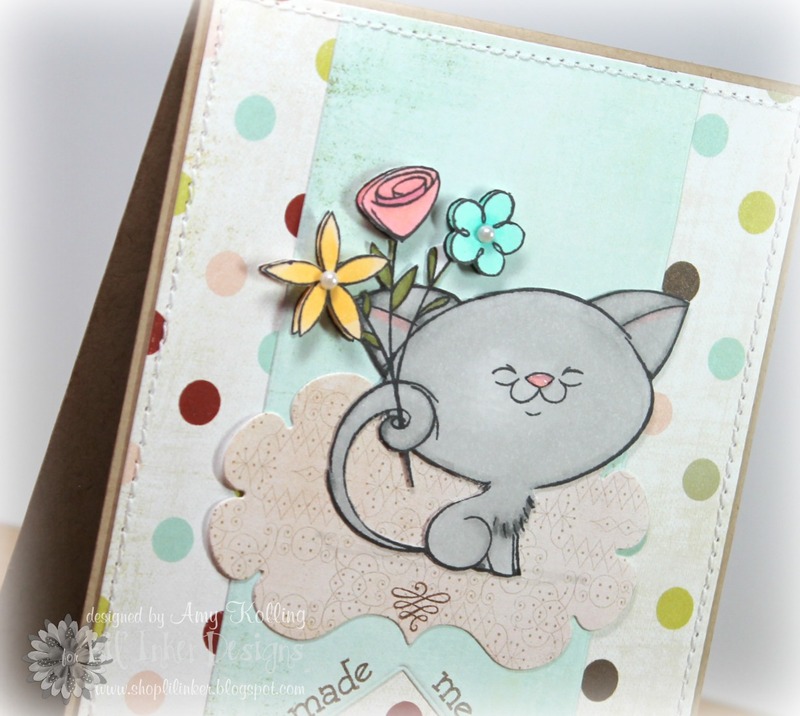 Thanks for stopping by and we'll see you tomorrow for Day 4 of the Lil' Inker Designs New Release! Hi everyone!! Welcome to the Lil' Inker Designs New Release Blog Hop---Day 2!! 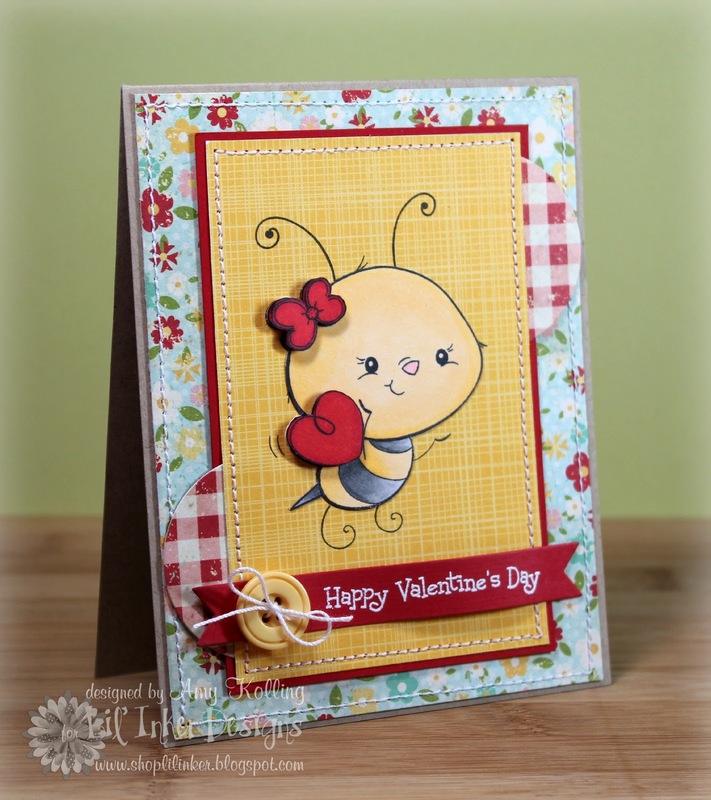 Today is my day to share the newest stamps and dies from Lil' Inker Designs! If you've come from Laura Pryor's blog, then you are in the right place! OH MY GOODNESS! I truly love the newest stamp set and die combo being released this week. Let's introduce: Flags and Tags. 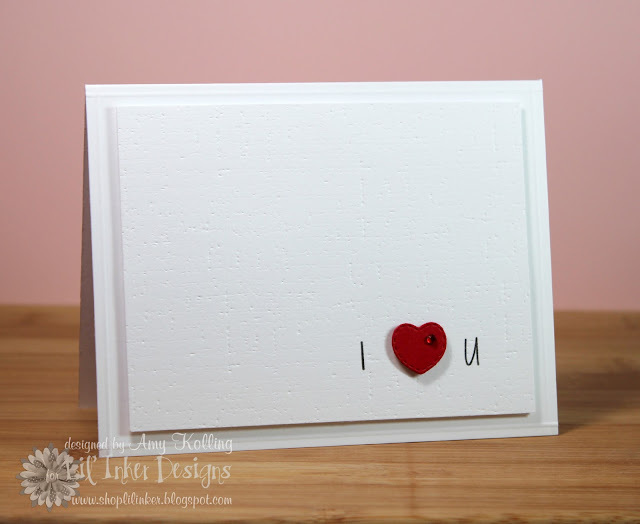 This stamp set has the most beautiful sentiments and frames to coordinate with the die. Such a versatile set in so many ways! Below are the coordinating dies. These can be used separately or together for gorgeous layered creations. 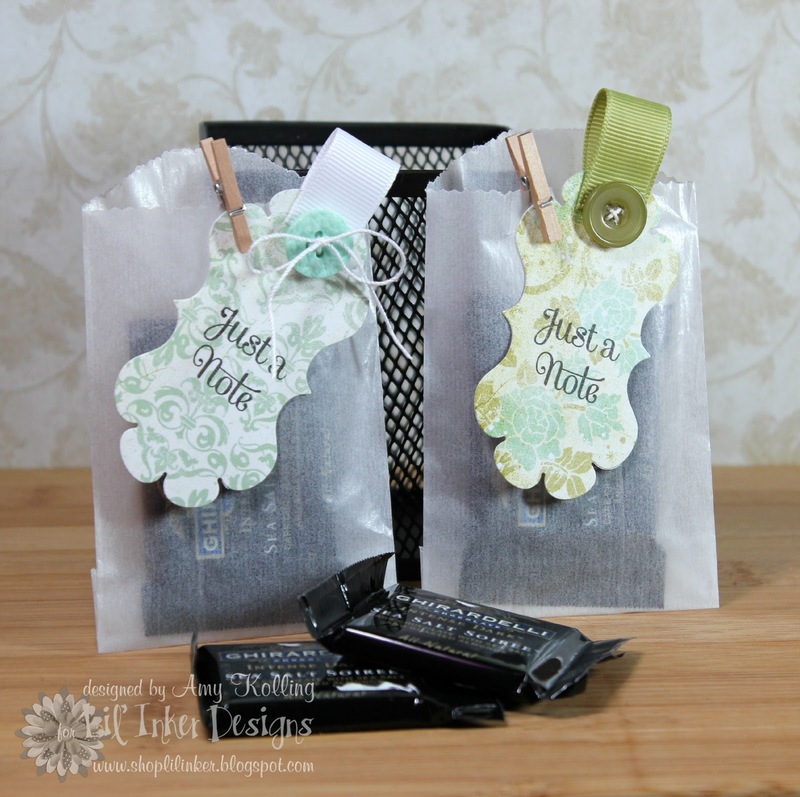 First up is a cute little tag idea to dress up some tiny glassine bags.....just perfect for one Ghirardelli Chocolate square. ****Disclaimer: No chocolate was eaten during this crafting session.....hehe. Seriously, this is my new favorite Ghirardelli chocolate! **** Here I've die cut the frame using some DP from FancyPants and added a sewn on button to a ribbon tab. 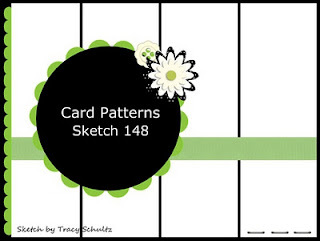 Next up is a CAS card using the polka dot die image layered with the double ended banner die. My base was impressed with the Linen Impression Plate from PTI. My last card for today uses the polka dot frame to stamp these fun stitched images to create my own background paper.....I love how this turned out! Kinda fun and funky! I want to mention that each of the sentiments included in this set fit PERFECTLY on this banner. 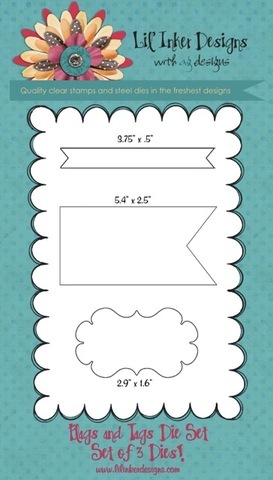 Ok, well that's it for today but I haven't even showed anything yet using the BIG die from the Flags and Tags set. More to come on that one! 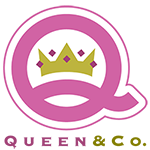 You will want to make sure to leave comments on all the blogs during the blog hops this week as Laura will be giving away some prizes..........and who doesn't love prizes??? Your next stop is Alicia's blog where you will be certain to see some beautiful projects!! Jessica from There She Goes Stamps was generous to send the Design Team digital images to work with. Well, I chose a set that I've had my eye on FOREVER and it's perfect for Valentine's Day! 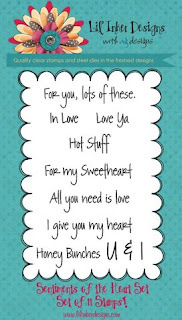 I've used Buckets of Love stamp set from TSG. The image was colored with various Copic markers and paired with some yummy pattern paper from the Love Me collection by My Mind's Eye. 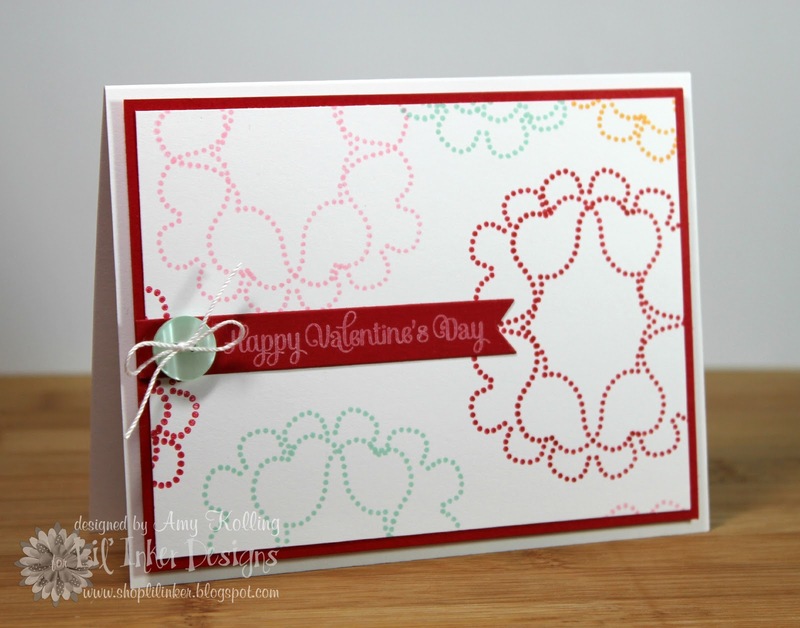 I also added in a Pure Poppy threaded button with the new Doodlebug Valentine twine.....can you say LOVE?? Thank you all for your support of Wee Memories and I know I will miss designing for Jenny!!! Here's to a great 2012 for Jenny and her new ventures! 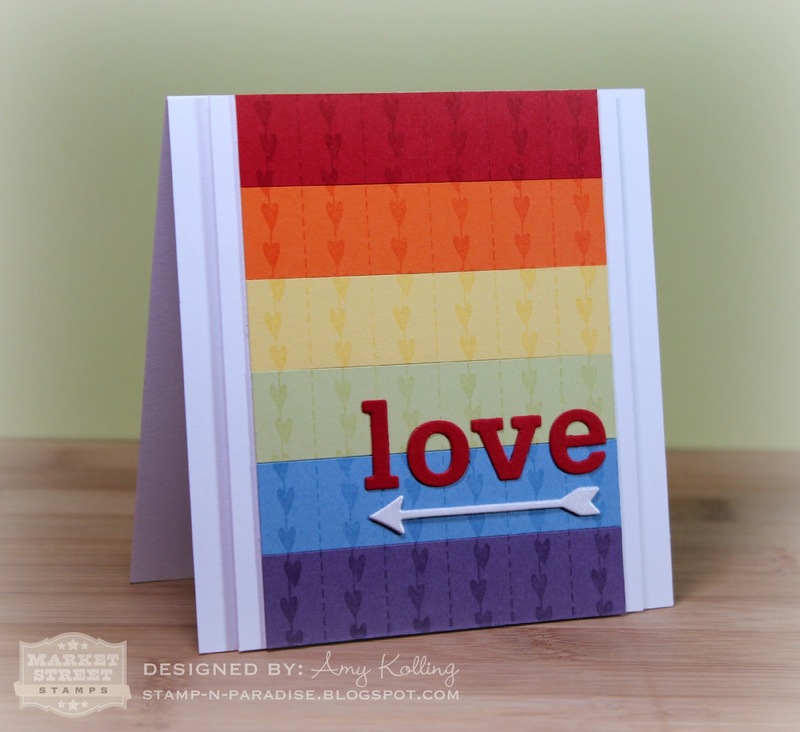 I decided to use the "It Takes Love" stamp set that was recently released. Using a current sketch, I pieced this CAS card together fairly quickly. I decided to use some of my DCWV cardstock as it matched the colors the best. I stamped the sentiment twice and cut the pink "LOVE" section out and popped it up for dimension and to add a statement. I love doing this lately! Speaking of Market Street Stamps........have you seen the newest addition to the lineup? Stephanie has done a great job of designing this kit for not only scrapbooking projects but cards too! It can be used virtually all year round! 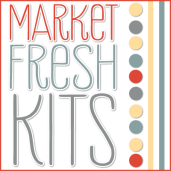 Check out the Market Street Stamps blog for photos of the kit and contents and then stroll over to the Marketplace and pick up your own kit! Now go get those MSS out and link up your project for the Paint the Town Challenge! Gosh, where has the week gone? I haven't posted since LAST Saturday! Well, things have been busy and as you might already know.......there are some changes and sad news for the Wee Memories Challenge. Jenny has decided to stop the Wee Memories Challenges at the end of January. Check out her blog post HERE. Jenny, I wish you the best of luck with your new adventures and I'm sure they will be exciting! Thanks for having me on your DT the past 6 months! So are you ready for this week's challenge? It was my turn to host this challenge. 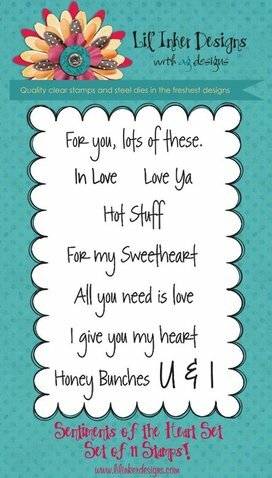 I chose something that is dear to my heart..........Mini cards. If you follow my blog at all, then you know that I make mini cards for pretty much every holiday for my kids. I put them in their mailboxes at their seat at the table on the morning of the holiday! They so look forward to this! You can see a picture of their mailboxes HERE. This week's sponsor is non other than My Favorite Things and yes I do LOVE them! Especially their dies and Pure Innocence stamps. So I've paired them up here for a mini card for my daughter for Valentine's Day. The papers are from the new MME Love Me collection. The best thing about these paper pads is that everything coordinates. Takes the guess work out of it for you! The postage frame die is from the First Class Friend set. Thank you so much for stopping by......I truly appreciate each one of you! Have a great weekend!